Reconcile with Nature, ProAves conservation strategy that promotes environmental awareness. Domingo de Ramos, Carmen de Atrato Chocó. The Reconcile with Nature campaign achieved once more that a celebration of great religious significance could be lived in harmony with God and nature. 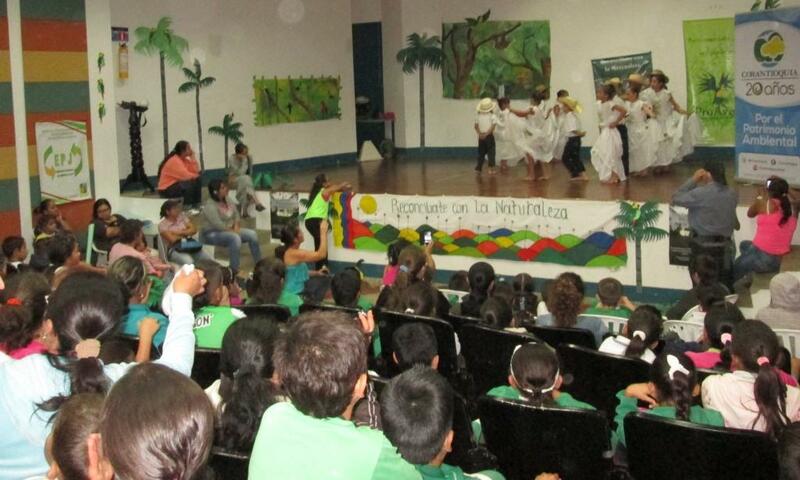 During the celebration of Palm Sunday, ProAves in its line of Environmental Education, celebrated the Campaign Reconcile with Nature in Bogotá and in nine towns of Colombia among which were Génova, Quindío; Cajamarca and Roncesvalles, Tolima; Anorí, Urrao & Jardín in Antioquia; Minca, Santa Marta; Algeria, Cauca and, for the first time, in Carmen de Atrato, Chocó. In these municipalities, environmental educators together with some town and regional authorities and environmental groups, conducted various activities to promote respect for nature during Easter Week, with the aim of replacing the Wax Palm branches and other wild palms with alternative branches to prevent the destruction of these important trees which act as life support to many endangered species. 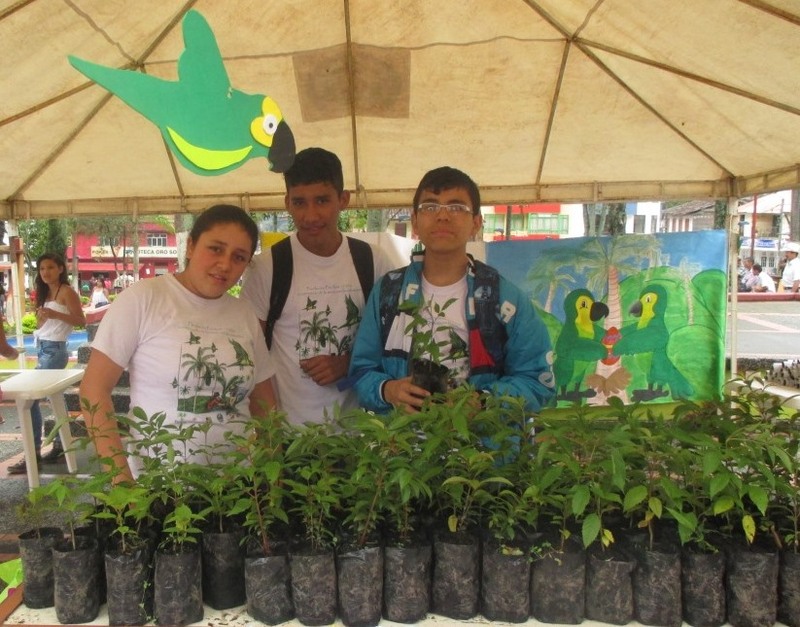 Thus, prior to this celebration taking place in the towns, activities took place to promote the protection of endangered species, especially the Wax Palm, with the participation of over 8,200 people nationwide. 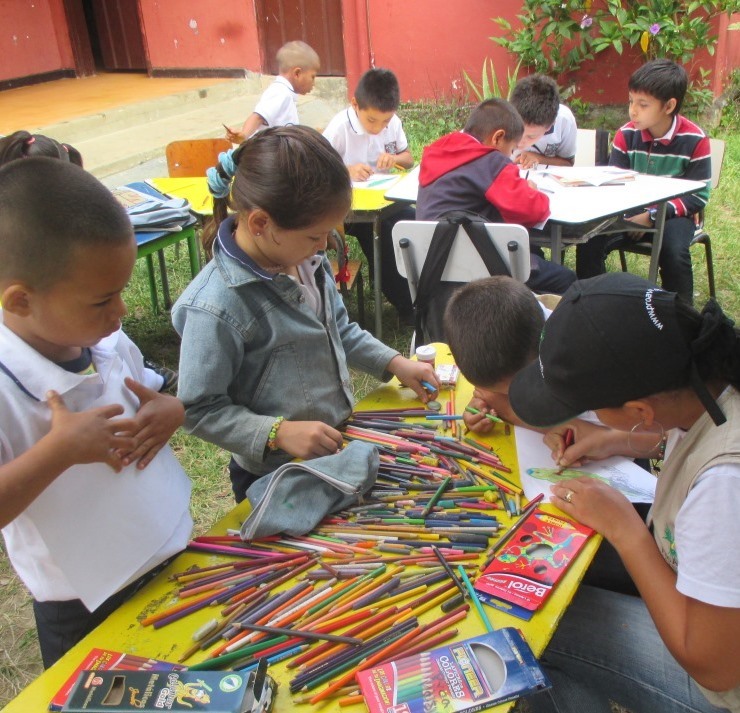 Ecological workshops in educational institutions, craft workshops with alternate materials to the Wax Palm, nature walks, programs and radio spots, visits to ProAves Reserves, birdwatching outings, information stands and ecological stands where crafts allusive to the Yellow-eared Parrot made ​​by Ecological Groups were delivered, the planting native trees, cleaning streams, Cinema in the Park, cultural events, neighborhood activities, painting competitions and ecological broadcasts on community channels. Domingo de Ramos, entrega de árboles nativos. Génova, Quindio. 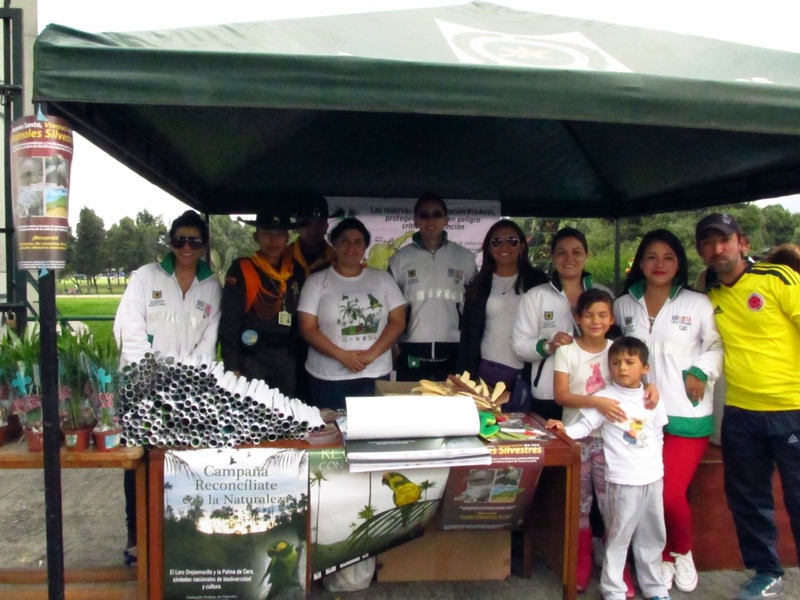 In Bogotá, with the support of the Episcopal Conference, the Ecotheology Table, the District Department of the Environment, the National Police and Jardineros of Colombia among others, a religious ceremony was held in the Simon Bolivar Metropolitan Park where, with the support of some communications media, many people learned through workshops, itinerant stands and promotional material the importance of preventing the illegal trafficking of these important species. The town of Carmen de Atrato, Chocó, the first version of the Campaign was held with talks and conversations with the community about the importance of protecting Yellow-eared Parrot’s habitat getting community participation and that the church was the main replicator in the care of nature and in harmony with God. Lanzamiento Bogotá, Templete Parque Metropolitano Simón Bolívar. 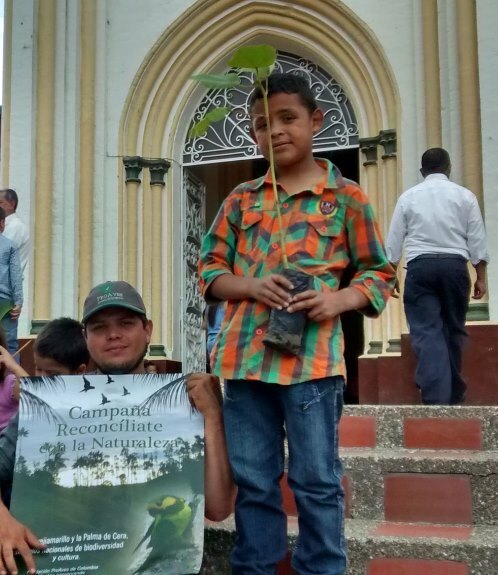 The campaign successfully completed on Palm Sunday with the delivery of 500 native trees to plant and delivered 1000 alternative branches and 1,500 posters for the campaign. Although the use of bouquets Wax Palm for Palm Sunday was introduced, these were seized with the support of the National Police and the Corporations, in all the towns where the campaign was performed in some locations live plants were used that favor the protection of endangered species. Domingo de Ramos. Cajamarca, Tolima. The main achievement of this campaign was the participation and support of local communities who over the years have assumed a change of attitude regarding the use of the Wax Palm and other threatened palms, opting to use alternative plants or different materials that allow a celebration in harmony with God and reducing negative impacts on nature. Similarly partnerships are highlighted with various municipal, regional and national entities, to whom we extend a special thanks, as they have strengthened awareness and reach many more communities with the message of defending and protecting our environmental heritage .